For a Cuban inspired dinner, I prepared the following recipe. It was both easy and flavorful and definitely a hit among our guests! The recipe comes from Emeril Lagasse and I used whole tilapia fish. I will definitely make this again! Rinse the fish well under cold running water and pat dry on both sides as well as inside the cavity. Make several slits about 1/3-inch deep on both sides of the fish. Place the fish in a non-reactive shallow dish or platter and pour the lime juice over the fish. Set aside while you continue with the preparations. Rub the bottom of a shallow glass or ceramic dish large enough to hold the fish with 2 tablespoons of the olive oil. Saute 1/2 of the onion slices and 1/2 of the pepper slices in 2 tablespoons olive oil and then place along the bottom of the baking dish. Lay the lemon slices over the vegetables, but reserve a few slices to stuff inside the fish. Drizzle with 2 tablespoons more of the remaining Spanish olive oil and season with salt, black pepper, to taste, and crushed red pepper flakes. Place the fish on top of the sliced vegetables. Using a mortar and pestle, combine the garlic, kosher salt and oregano and mash to form a paste. Spread the garlic paste inside the cavity of the fish and into the slits on top. Place the remaining lemon slice inside the cavity of the fish. In the same small bowl that you used to make the garlic paste, combine the tomato puree and vinegar and stir to combine. Pour this tomato mixture all over the fish. Top with the remaining onion and pepper slices and drizzle the remaining olive oil and the wine over the top. Season again with salt and black pepper, cover the dish loosely with aluminum foil, and bake until the fish flakes easily when pierced with a fork, 45 to 50 minutes. Garnish with the green onions and serve hot or warm, with the pan juices drizzled over all. We eat quite a bit of tilapia in my house - the kids like it because it isn't "fishy". I think next time I'll try this - it looks really refreshing! This looks great! 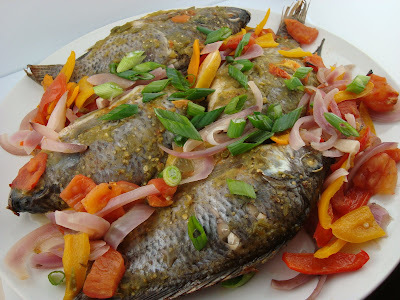 I haven't seen tilapia whole but I'd love to try this with filets.